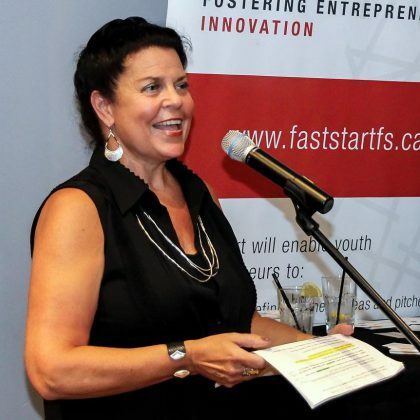 100 Women Peterborough has done it again. 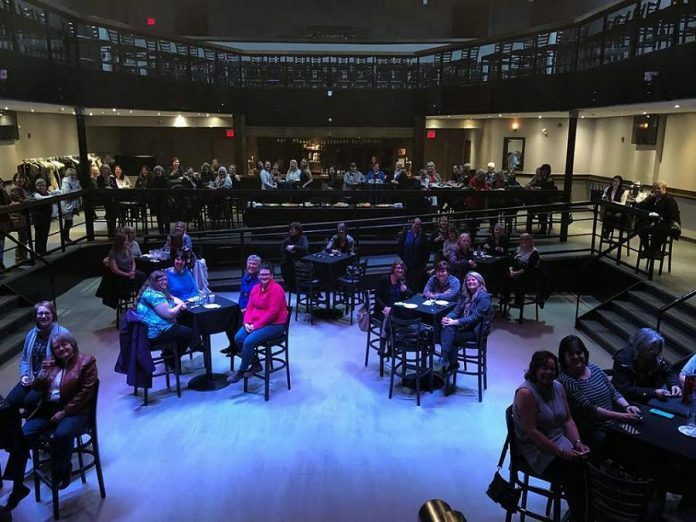 At their first meeting of the year on Tuesday night (March 19) at The Venue in downtown Peterborough, the collective philanthropy group raised over $10,200 in under one hour for Brock Mission’s Cameron House. 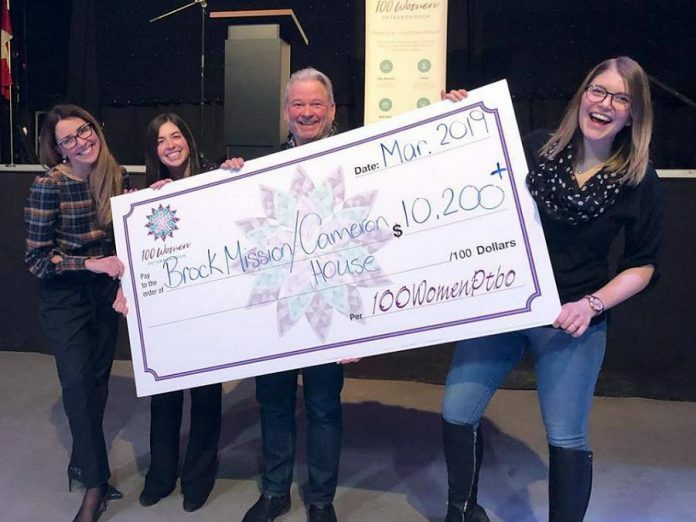 The concept of 100 Women Peterborough is simple but very effective: four times a year, members of the group gather to hear presentations from three selected non-profits or charities in the region about projects for which they are seeking funds. Well before each meeting, the three organizations are randomly drawn from a larger list of organizations nominated by members. After listening to the presentations, each woman places a blank $100 cheque into a box representing one of the three organizations. The organization with the most votes receives all the donations (including later donations from members who are unable to attend the meeting). At the March 19th meeting, the three selected organizations — Brock Mission, YWCA Peterborough-Haliburton, and the Peterborough Public Library Foundation — made their presentations to the group. When all the votes were counted, Brock Mission came out on top. Cameron House, which opened in October 1996, is a short-term emergency shelter for women with 12 beds that supports 250 women annually. In 2011, Brock Mission added eight bachelor units to the site to create Cameron House, Too!, which supports women who have difficulty retaining stable housing. Women staying in these units pay a modest rent, have the support of their familiar shelter, and also receive assistance with a Life Skills program. The program is customized to suit the individual, and provides education and training for independent living. The donation from 100 Women Peterborough will help Cameron House fund a new laundry room, as well as much-needed upgrades to their current facilities. 100 Women Peterborough was founded in February 2018 by Wendy Hill, Alyssa Stewart, Catia Skinner, and Rosalea Terry, who were inspired by similar groups in other communities. The collective philanthropy movement began in November 2006 when Karen Dunigan of Michigan formed the “100 Women who Care” group. After that group’s first meeting, the women raised over $10,000 for the purchase of 300 new baby cribs for a local organization. The movement has grown over the past 13 years to include almost 100 chapters in North America, including at least 15 in Canada. 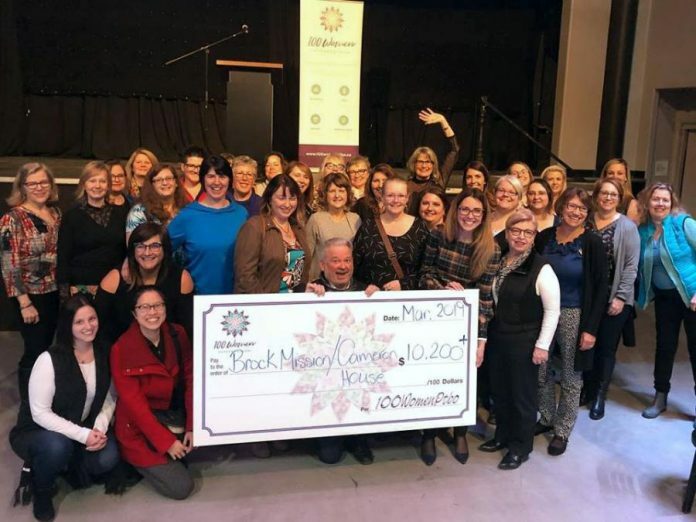 Since it was founded, 100 Women Peterborough has increased its membership to well over the original goal of 100 members, allowing the group to exceed $10,000 in collective donations. Last year, 100 Women Peterborough raised almost $50,000 in donations for four local organizations: Hospice Peterborough, Peterborough Youth Unlimited, One Roof Warming Room, and New Canadians Centre. Women who interested in joining the group should visit www.100womenptbo.ca for more information.